Join the discussion on our forums! Come discuss Abominable Bowman over in our dedicated Abominable Bowman discussion topic. Could be good in a Mech/Bomb Hunter deck running either King Krush or Witchwood Grizzly. Perfect, summon a Jeweled Macaw. What a deal. Maybe if Big Hunter was a thing, this card could have some legs, er, bows. In the opponent's hands it's Summon a random Savannah Highmane that died this game. This is OK with a deck that doesn't run any of the early game that Hunters currently use. Who knows, maybe one day that will make sense. 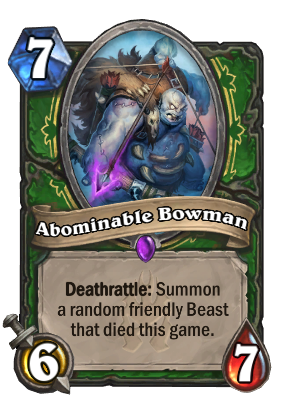 i glanced at this card just a second while scrolling down and thought it reads "adorable bowman"
But the stats are better per mana cost... and you can decide which beasts to put in your deck. Everyone forgot Terrorscale Stalker already? I actually think you want this is a non-N'zoth deck. Most of the Hunter deathrattles summon small 1/1 tokens which you definitely don't want this card to bring back. You want to bring back minions like the new Bearshark or even any of the Animal Companions. If you do run this with N'zoth, you don't run Kindly Grandmothers or Rat Packs, Probably just Highmane and these guys as your deathrattles. Also nice because besides Curator or King Krush, Hunters had no turn 7 plays. Maybe one of the best ways to play this card would be to play a midrange Hunter deck based on early non-beast minions and secrets, and then on summoning the big beasts like Savannah Highmane, Swamp King Dred and even certain zombeasts. That would mean the value of this card would rise a lot, without the risk of getting a 1/1 token or something. Don't forget the two from call of the wild! When you don't summon one of the hundreds of 1 drops and tokens Hunter spits out every game, it'll be good. Yeah, This deck is the best because you have tons of awesome death rattle minions that drop multiple small creatures! I could get a 2/2 Hyena, a 1/1 hound, or best yet a 1/1 spider. The value of this card!